The current signup bonus offers a 100% match in free bets of your first deposit up to the value of £150. Make sure that you are aware of the wagering requirements that come with the free bets as this means you will have to gamble them a number of times before you withdraw. The website specialises mostly in slot machine based games. However, these come with an array of special features and add-ons that make them much more complex than your standard one armed bandits. Game themed slots and slot machines based on TV shows and other franchises are a specialty of this site. 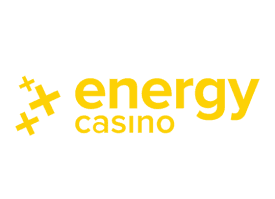 Energy Casino uses standard white labelled casino software that makes it relatively easy to pick up and play on almost any system. However, this means that there is not a specialised mobile app for Energy Casino and that if you want to play on the move, you will have to use the standard website. A wide range of deposit methods and systems are available at Energy Casino. As well as making a deposit using your Visa or MasterCard debit or credit card, you can top up your gaming account using a range of popular online wallet providers. Maestro debit cards are also accepted at the casino. All of the deposit methods that are available are also offered when you want to make a withdrawal. This means that you can have your winnings sent back to the credit or debit card that you used to make a deposit or that you can add the funds to one of several popular online wallet systems. The casino is currently only available in English, French and German although beyond the terms and conditions you don’t need a particularly strong grasp of any language to play the games. The site is fairly fast and simple to use so using an online translation service to play is also an option. The casino accepts deposits and allows users to play in British pounds sterling and euros. The currency of play will depend on the country that you say you are based in when you first sign up for the casino. It is possible to deposit in other currencies, the conversion will be handled. The specialty of this casino is undoubtedly the range of slot machine games that they are able to offer. While several table based casino games are also available, these are very much the add-on, rather than the core focus of the website. If you are not a big slot machine player, you may look elsewhere. The support system at the casino is extensive and is available from 9am until midnight Central European Time. You have the option of sending an email, using a live chat system or making use of the contact us form that is on the support page. Response times are fairly rapid.